Edward Primeau was born in 1958 in Detroit, Michigan. He attended the University of Detroit where he majored in communications and minored in criminal justice. He began his career as an audio engineer in 1979 at Ambience Recording Studio, also in Detroit, MI. 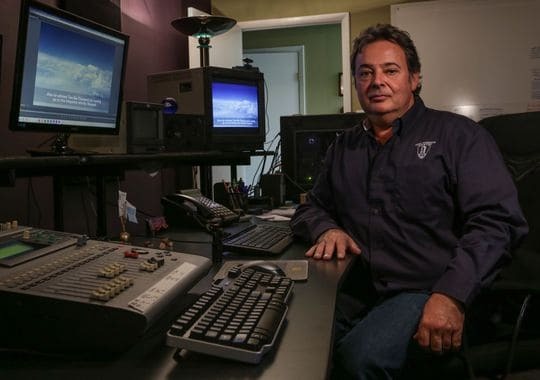 While employed at Ambience Recordings, Ed was asked to conduct an audio forensic examination for the FBI in Detroit. 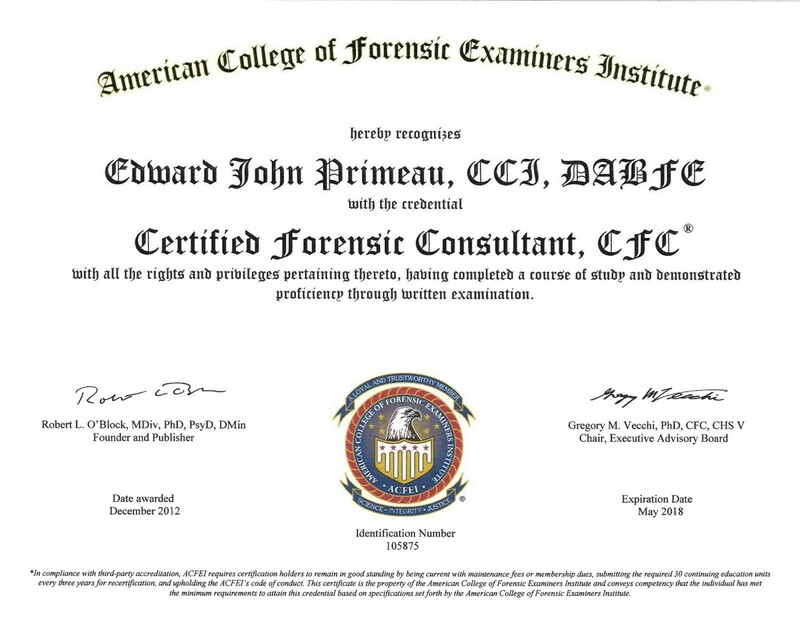 Years later, in 1984, he left Ambience to pursue his career as a forensic expert and started the company, Primeau Forensics, LTD. Since then, he has completed hundreds of successful audio and video forensic investigations which include, but are not limited to, audio and video forensic analysis, audio and video forensic enhancement, audio and video forensic authentication and audio & video forensic recovery. He has testified in Federal, State and Local courts, as well as for the Judicial Tenure Commission and the Michigan Public Service Commission as an expert witness. 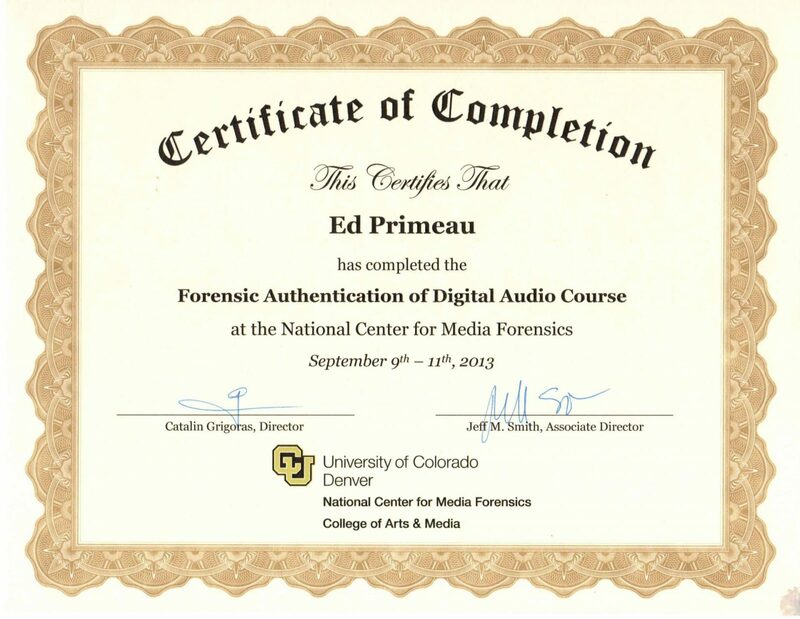 He helps courts and law enforcement agencies understand the science and technology of audio and video forensics. 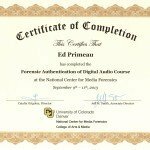 His forensic philosophy is that authentication and clarification of audio or video media combines art as well as science. The methods that he uses require attention to detail and scientific principles, complemented by an appreciation for clarity and aesthetics. 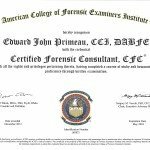 His techniques are derived from both a formal education and the application of skills gained by working in many forensic situations. He also looks at forensics as an experimental science, because there are no two cases that are the same. As a forensic expert he conducts experiments that include variables and that measure how each outcome pertains to the scientific aspect of the case at hand. His forensic processes that he uses to arrive at his opinions are accepted in the scientific community and are structured and methodological. He always takes scrupulous work product notes that are a part of each case. Along with actively working on cases, Ed has consulted with the media on several notable cases. Some of the biggest cases include: Trayvon Martin V. George Zimmerman, Malaysia Airlines Flight 370, and Laquan McDonald. Ed, along with JFK assassination researcher Bill Kelly, assembled and restored the Air Force One recordings from the day that JFK was assassinated. He also performed a Voice Identification on Susan Bennett, a voice over actress, and was able to positively ID her as the voice of Apple’s Siri. When he isn’t using his expertise as a digital media forensic investigator, Edward enjoys jamming on the drums and piano with his friends, the art of numismatics (the study and collection of currency), and promoting a healthy lifestyle. Not only is he a vegetarian, but he is also an avid juicer. 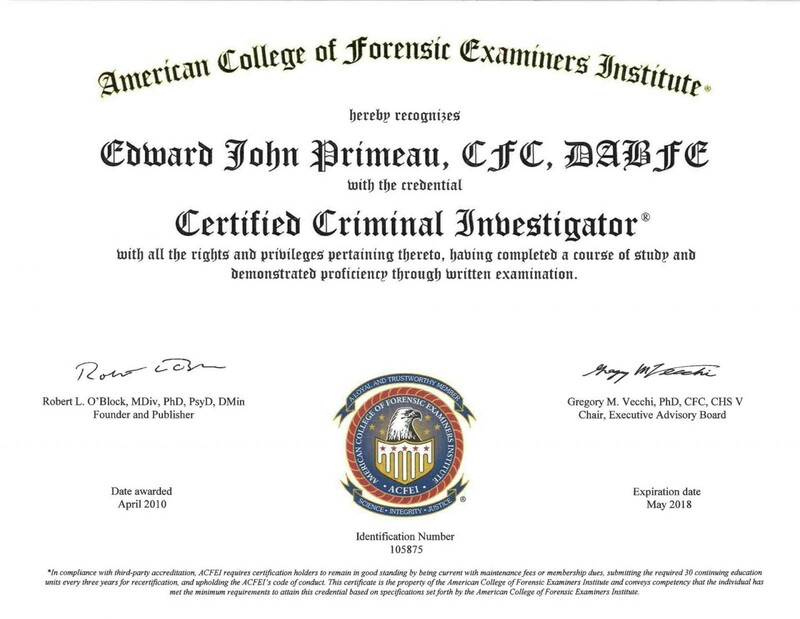 Edward Primeau is a Registered Investigator and Certified Forensic Consultant with the American College Forensic Examiners Institute , a member of the International Association For Identification and Audio Engineering Society. 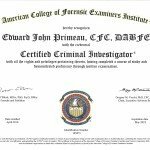 Ed is also a member of the American Board of Recorded Evidence.